For the fifth anniversary edition, the chocolate show, the UK’s biggest celebration of our favourite sweet treat returns to Olympia from 13-15th October. 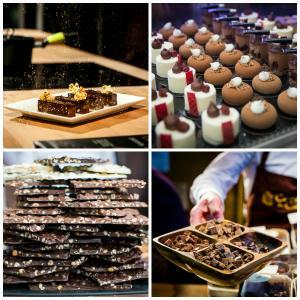 Attracting over 20,000 chocolate fans and foodies, the event showcases chocolate in all its forms, from bars and bakes to desserts, patisserie, ice cream and truffles. This year’s show promises experiential activities, interactive features and edible delights for young and old alike. 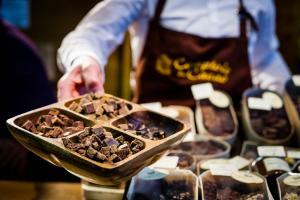 Over 100 fine chocolatiers, chocolate companies, pastry makers and artisans from across the globewill gather together for three days of cocoa festivities. Chocoholics will also be treated to celebrity chef demonstrations, master classes, tastings, sculptures and many, many new features, all to be unveiled soon! The show will also host the 2nd annual Chocolate Dessert of The Year competition, which was won by Head Pastry Chef David Simak of Albert and Michel Roux Jr’s Crossbasket Castle in 2016. 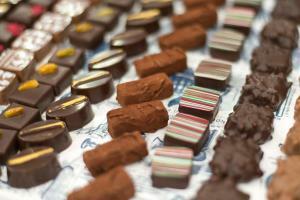 Run in partnership with Chocolate Week (9-15th October), the show is a true celebration of fine chocolate, raising awareness of the chocolate industry and show casing talent from across the globe.